Sulfur deficiency is a little known nutritional problem that can have very serious consequences for your health. A deficiency of sulfur can raise homocystiene levels and put you at risk for a heart attack. You can correct this problem by including sulfur rich foods in a heart healthy diet that contains sulfur amino acids that will help your body prevent the buildup of toxic homocystiene and prevent heart attacks. 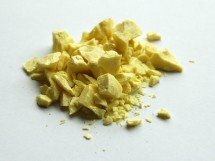 Sulfur is pale yellow in color, and a brittle, odorless solid substance. However it is essential to life! Why is sulfur deficiency so problematic? Sulfur appears in your body in the form of sulfur amino acids like methionine, taurine, cysteine, and cystine. Of these methionine is the only one that your body can't synthesize, so it has to be supplied by your diet. These sulfur amino acids are vital to a process called “methylation” by which the amino acid methionine is converted first to homocyteiene, and then in a final step, to cystiene. Without adequate sulfur the conversion process does not fully convert homocystiene to cysteine, and toxic levels of homocystiene build up in your body causing inflammation and damage to your arteries, leading to heart attacks and strokes! What are some of the things sulfur does in the body? Problems that lack of sulfur can be a factor in. The established need for sulfur is 10mg per kilogram of body weight for each of the sulfur amino acids, which would translate to about 680 mg of methionine, cysteine, homocysteine, and taurine (for a 150lb person, or around 900 mg for a 200lb person. The best way to get the sulfur you need and avoid sulfur deficiency is through your diet. Fortunately there are a number of sulfur rich foods that will supply all the daily sulfur you need. Getting enough is usually only a problem if you are a vegetarian or vegan. Plant based diets that many vegetarians follow don't supply all the needed sulfur, so you need to make sure you pick foods that will cover your needs for this vital element. The best known sulfur supplement is probably MSM (methylsulfonylmethane). It is an organic sulfur compound that has purported benefits for arthritis and joint pain. It is thought to function as an anti-inflammatory, but has yet to be proven scientifically. To avoid sulfur deficiency and lessen your chances of suffering a heart attack or stroke, pay attention to your intake of sulfur rich foods, and be sure to include them in your heart healthy diet.